Tourism in Costa Rica starting to Recover. Paved highway from Quepos to Dominical finally complete! We have driven the new highway many times already and while we miss a little of the charm of cow parades and funky old bridges, we are glad to say goodbye to the potholes and the unpredictability of the road conditions. We are sure many of the locals living along the old stretch of highway are glad to be rid of the gravel dust and the constant 18-wheelers rattling past their homes as well. Driving from Dominical to Quepos is now approximately 30 or 40 minutes and just one hour more to Jaco. The real estate market is showing some signs of life again after a very slow year. 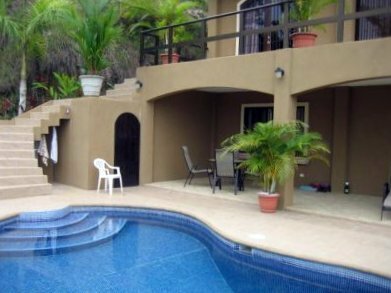 For those who have been thinking about Costa Rica real estate for a while, now might be a good time to have a look again as there are definitely some good buys in the market. For those looking for large parcels of land, it seems many would-be developers are also selling, but at discounted prices. 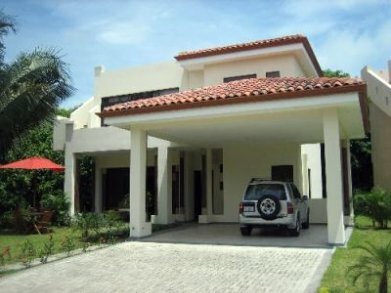 Below are a couple properties in the Jaco / Hermosa area that we think offer great value. There are some good deals right now, so contact us if you would to like see other listings more specific to your needs. New Ocean-view home in Playa Hermosa. Walk to the beach. Reduced $100k to $385,000 US. The main home has 3 bedrooms, 2 bathrooms with granite counters, stainless steel appliances, select tile floors and upgraded fixtures giving you a warm and tropical feel. here are also 2 separate lock-off 1 bedroom/1 bathroom suites with kitchens which are currently rented for $600/month each. With over 2800 sq. ft., this 3 bedroom, 2.5 bathroom home comes completely furnished and has full stainless steel kitchen with granite counters, laundry room, a tropical style indoor/outdoor dual shower in the master bathroom and a 3rd floor observation deck perfect for a hot tub! It also has great views of the ocean and the mountains and is fully titled. Steps to the ocean and beach club exclusive for this community. or more information on Costa Rica real estate or any of these newsletter stories please feel free to contact Tina Wallace at TS Water.